Nothing boosts my motivation to conquer a hefty to-do list more than the necessity of completing it in order to enjoy a planned activity. 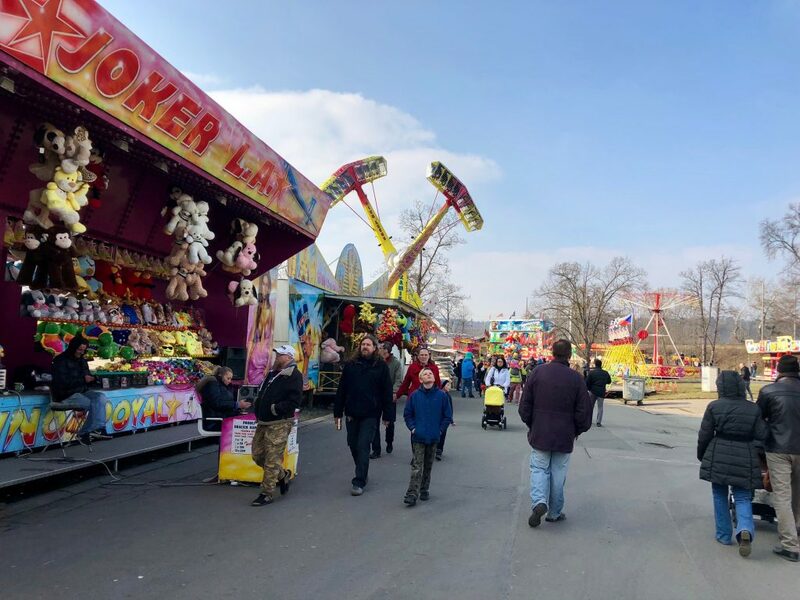 To break from a half-hearted homework session, my friend Jillian and I decided to check out St. Matthew’s Fair (Matějská Pouť) since it was one of the few weekends we’d stayed in Prague. Scoping it out a bit had us quite stoked but we refrained from lingering for very long. We knew it would be better to return the following day because of the weather. For the first time in ages, the little icon on the forecast for the subsequent day displayed a sun rather than a cloud. The joyful anticipation generated the most productive mid-term paper writing of my college career. When we returned the next day, my excitement lifted my feet from the ground and carried me through the gate rather than allowing me to walk in nonchalantly. It was the type of elation that steals your oxygen away and stifles your ability to speak. The sunny blue skies and stimulating atmosphere sent my spirit into a higher realm of happiness. A distantly familiar sense of pure child-like joy engulfed every bit of adulthood that had been governing my days. I transformed back into a kid as I walked amongst dozens of rides that so distinctly dwell in my memories. I could recall the names of each one I’d conquered countless times such as The Sizzler, The Zipper, and MaxAir. Feeling venturesome, I ordered a potato pancake, or a “bramborák” as Czechs would say. Let me tell you a little something about Czech food . . . it is heavy. Combining the heaviness of an average Czech dish with the greasiness of fair food results in a satisfying meal, yet one that can only be stomached once in a blue moon. Oodles of napkins later, we continued to explore. Every corner we turned offered a new platform for adventure until we reached the ultimate adversary: 80 meter (262 feet) tall swings. We shrieked with delight as we were lifted above the humming festivities to the most unique perspective of Prague we’ve seen yet. It’s truly shocking I didn’t throw up the cheesey and potatoey ingredients of the bramborák I’d consumed less than an hour earlier. We celebrated our triumphant (and puke-less) flight with five of the best foods that exist all combined into one delicious concoction: a bubble waffle overflowing with Nutella, strawberries, Kinder chocolate, and ice cream. The day, which provided us with the first genuine hope of springtime, was one of my favorites spent in Prague. I was, once again, reminded about the gems hidden within the vicinity of our own backyards.